BUDAPEST, Hungary (AP) Former Belgium and Algeria coach George Leekens was hired by Hungary on Monday. 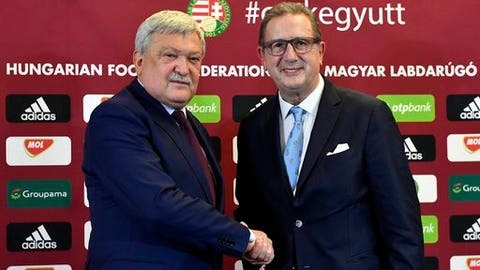 The Hungarian Football Federation gave Leekens a two-year contract to the end of qualifying for the 2020 European Championship, with the option of a six-month extension if the team qualifies. The federation said Leekens will assume his post after Hungary’s two friendlies in November, when the team will be led by interim coach Zoltan Szelesi. Former coach Bernd Storck left the job two weeks ago. Hungary reached the European Championship last year for the first time since 1972, and last qualified for the World Cup in 1986. Leekens, a 68-year-old former Bruge defender, had two stints leading Belgium. He resigned as Algeria coach in January after the team’s early exit from the African Cup of Nations. ”Leekens is a guarantee that professional work will ensue at the top national team as well as the under-21 team, which will also belong to the new coach,” Csanyi said. Soccer is a top priority for Prime Minister Viktor Orban, founder of the Ferenc Puskas Football Academy.